Kumiko and I before Soju Projekt's Noh lecture this summer at the Cerulean Tower Noh Theater in Tokyo. This year was our 25th anniversary! 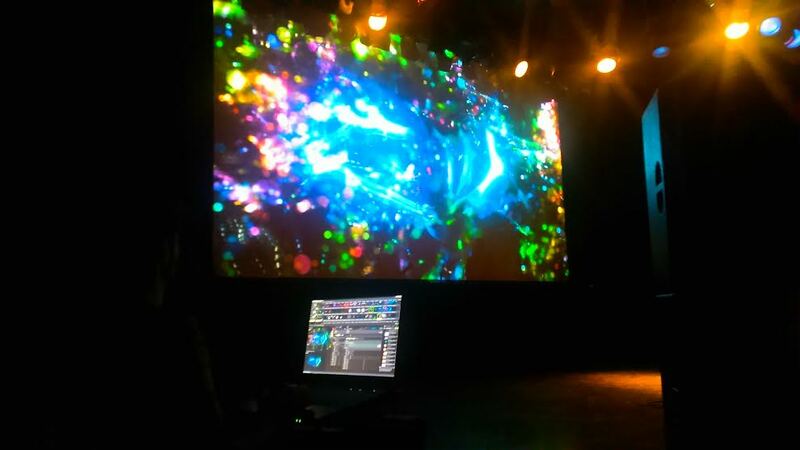 In November of 2015, Soju Projekt once again teamed up with Golden Heron Gamelan for an evening performance of music from Java, Indonesia. Our performance, at the Aljoya Thornton Place Retirement Community in the Maple Leaf neighborhood of North Seattle, provided the ambiance for a beautiful exhibition of textiles from around the world. It's always a joyful experience performing with Golden Heron Gamelan! 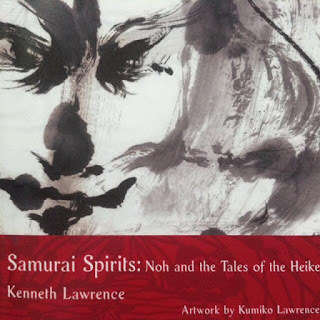 My retelling of the Noh play 'Kiyotsune' has recently been published in the winter 2015-16 issue of Parabola Magazine (http://parabola.org/ ), with sumi-paintings by Kumiko Lawrence. Most of us have experienced death in some form, the loss of a friend or loved one. If you could have just one more hour with that person, what would you do? What would you say? In this play, the spirit of a samurai warrior, drawn by his widow’s intense suffering, returns to offer her solace. 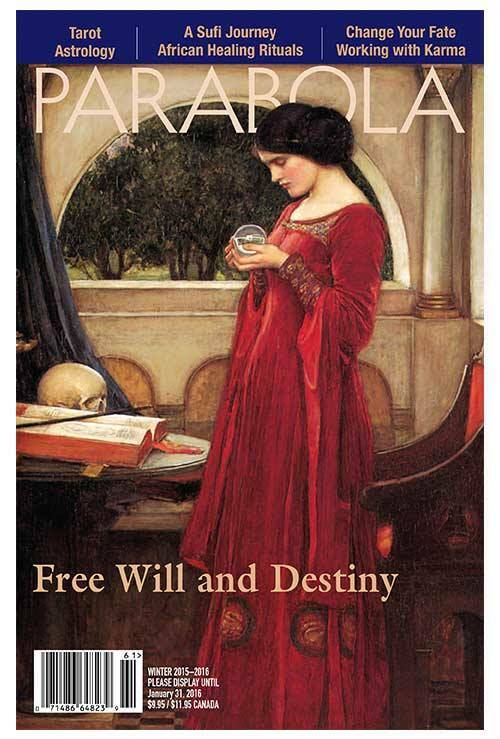 They talk of loss, of anger, of fate and free will and the importance of forgetting. A sleeping ocean bird sinks in tears of rain that fill the salty sea. A cloud floating. Water flowing, returning to its earthly home; the heart gropes blindly but in vain. Her sight grows dim, her heart faint. Through the night she weeps, yearning only for his return, even in dreams. Then she hears his voice: “Dear one, I have come for you.” The ghost of her husband appears by her pillow. While doing research for my DigiLetter (https://us.mag2.com/)on the Japanese epic Heike Monogatari ('Tales of the Heike' 「平家物語」) and the Noh plays it inspired, I've come across many samurai warriors I can relate to: Sanemori 実盛　and his concerns about ageism, Tadanori and his resentment for not receiving acknowledgement for his creative endeavors, the embittered old warrior Yorimasa 頼政　and his resentment of the opaque 'glass ceiling'... I don't think I'm unique in being able to relate to these characters. Their anger and disillusionment at the end of their lives transcends cultural and temporal differences. These are injustices that still occur today and are not uniquely Japanese. I'm no longer surprised at being able to relate to characters from a very different culture, in a very different line of work, from plays written more than six hundred years ago. It still surprises me, however, when I feel sympathy for a strange and evil demon. This has happened repeatedly over the years. I am not particularly evil, and I don't think that I flatter myself too much when I state categorically that, while I'm not perfect, I am, in fact, less demonic than most. And yet I am moved by the texts of several Noh plays of the 'Demon' category. 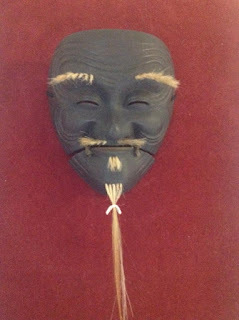 The Noh play 'Nue,' 鵺　for example, tells the story of how the samurai warrior Yorimasa, in his younger days, shot down the monster nue (literally 'nightbird,' a kind of Japanese chimera, mixing body parts of a tiger, monkey, raccoon dog and snake). The nue rose in a black cloud and descended upon the Emperor, terrorizing him until being felled by Yorimasa's amazing arrow shot. He was then killed, stuffed in a log and set adrift in a river. The story illustrates the heroic Yorimasa's amazing marksmanship. The Buddhist shadings of the Noh, however, tell of the sufferings of the nue, and of his shame. The play doesn't condone the nue's actions, but it conveys the monsters suffering sympathetically. It's cries for prayers to relieve its agitated soul's suffering are heart-wrenching. Maki-e artist Shokan Matsuda decorating a stratocaster. Presenting the art of the Japanese tea ceremony. Soju Projekt's Kenneth E. Lawrence and Kumiko Negishi-Lawrence took part in Five Senses Japan's event 'Senses of Japan' at Fran's Chocolates in Georgetown this weekend. Interpreting for master lacquerware artist Shokan Matsuda. 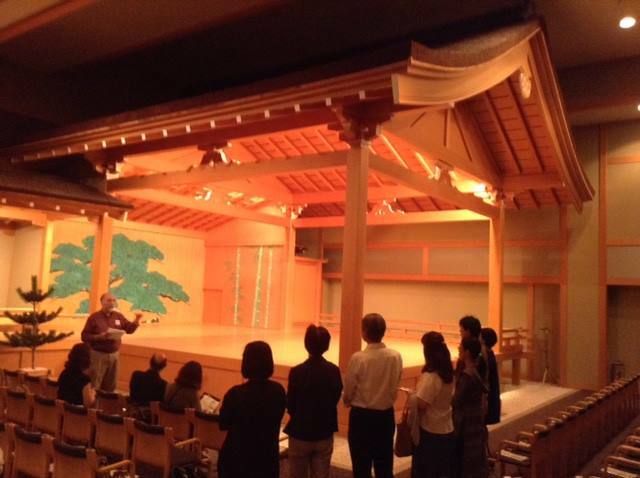 A pre-performance lecture by Kenneth before a biwa (plucked lute) performance by Kyokumi Tashiro. Giving historical background on the art of maki-e (literally 'sprinkled art'). A lecture-demonstration on the history and techniques used to create maki-e masterpieces. Reviving Japanese Tradition and The Stratocaster !! Soju Projekt's Kenneth E. Lawrence and Kumiko Lawrence took part in 'Senses of Japan' event at Fran's Chocolates this weekend. The event was a display of exquisite Japanese craftsmanship, impressive not only for the traditional techniques of the craftsmen, but also for the innovative ways they have developed to keep their art alive. One example was the work of Shokan Matsuda (松田祥幹) A third-generation lacquer artist, Matsuda-sensei applied the centuries-old technique of makie (literally 'sprinkled art' 蒔絵) to decorate an unusual item, a stratocaster electric guitar. Interestingly, the man who commissioned Matsuda-sensei's work, an avid collector of guitars, expressed similar concern for a disappearing tradition, the stratocaster, once the guitar of choice for many great guitarists. This means a lot to Kumiko and I because even a partial list of stratocaster players - Eric Clapton, Jeff Beck, George Harrison, Adrian Belew, The Edge, George Harrison, David Gilmore, Jimi Hendrix, Pete Townsend - includes many of the guitar greats who we listened to and saw in concert 'back in the day.' The stratocaster is now in danger of fading away. Matsuda-sensei used immaculate technique to hand-paint the lacquer, then sprinkle the gold, silver copper and brass powders. 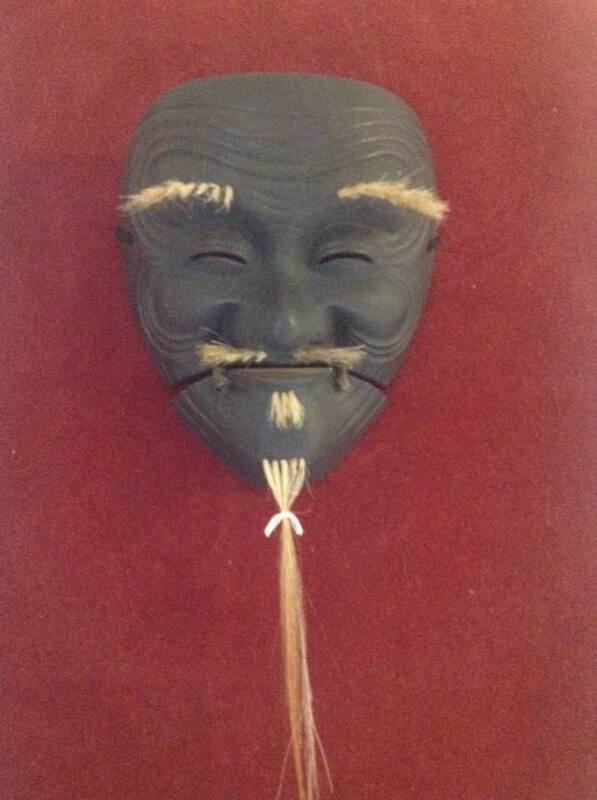 The selected design was of a demon mask and costume used in traditional Japanese theater. It was an excellent display of traditional craftsmanship, amazing to watch. It was also wonderful to see tradition and innovation in action. The Noh play ‘Adachigahara’ is a masterpiece of the genre. It manages to be simultaneously scary, frightening and haunting. What do I mean by that? But the Noh play ‘Adachigahara’ is more than just scary, it is also frightening. One reason is the nohkan, the flute used in all Noh performances. The nohkan is specially constructed to distort when overblown, giving it an eerie quality unique to Noh. The otherworldly kakegoe, the cries of the drummers, in addition to their important role as markers for the dancers, musicians and chorus members, are an essential part of the Noh esthetic. The masks too, with their bulging eyes and liminal expressions, are truly frightening, emphasized by the strong, sudden cutting movements of the actor. But what makes ‘Adachigahara’ a masterpiece is that, in addition to being scary, even frightening, it is a tragic, haunting play. Due in large part to the influence of Noh, there are moments of sympathy both for and by the demon, giving the play a pathos that can at times be wrenching. Three men come, a priest, his attendant and their servant. Beneath the sycamores, they don their traveling robes. Their linen stoles brush the undergrowth, their sleeves droop, heavy with dew. Senior priest Yukei is on pilgrimage through the province, part of the ascetic training of the yamabushi define. They leave behind their sacred mountain, setting off over mountains and down the coast. Soaked with salt they weave their way along the shore, a long string of days, reaching at last the bleak moors of Adachi. But it’s grown dark, and there is no hamlet in the area, only the light of a distant fire. They approach the small hut and ask the old woman there for lodging for the night. The priest smiles. “We are travelers accustomed to sleeping with only grass for a pillow,” he says. But inside the hut they see something unfamiliar. What is it? “It’s a spinning wheel,” she says. A never-ending, lowly task. Let me spin pure linen thread, turning it round and round. 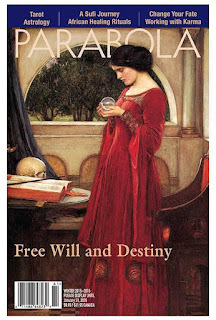 How I long to spin the past into the present!” She twines even at night, a life of such misery. Save yourself aspire to Buddhahood. We are but earth and water, fire and wind, nothing more. We assemble together very briefly, going ‘round the cycle of Birth and Death, forever revolving through Five Realms Six Realms of existence, and all this is but the doing of the illusory mind. Our life is a fast-vanishing dream, now here, now gone. Face your old age. Nobody can regain their lost youth. The old woman sings and she weaves. She sings of a nobleman, his hat hung with blue and white string, and of festival coaches covered with colored strings. She sings too of the pampas grass of autumn, waving at the moon with tufts as long as thread. Life, too, is long, so cruelly long. “Tonight is so very cold,” the old woman says. “I will climb the mountain, cut some wood for a fire to warm you.” She hesitates. “While I’m gone,” she says. “Do not look into that chamber.” The priest agrees, giving his word. Once she’s gone, however, the servant makes a confession: ever since he was young, he has had an overwhelming desire to not do whatever he’s told. The priest had given his word, but he, the servant, had not. Soon the priest and his attendant are asleep, but the servant, restless and curious, sneaks a peak into the chamber, then falls over backward in shocked surprise. Dead bodies, bones and decaying flesh, piled up to the rafters. A mess of arms and legs, all shining with an unnatural light. Pus and blood flow in streams, bodies bloated with stinking filth, flesh and fat all inflamed and rotting. Human corpses in countless number are piled up as high as the rafters. There is a poem: In the Black Mound upon Adachi Moor, a demon lives in hiding. The sound of approaching footsteps. An iron wand raised high to strike with mighty force. A fierce wind sweeps down the mountain and across the field as thunder and lightning fill heaven and earth. Priest and attendant chant mystic mantric prayers, rasping together their rosaries, invoking the five deities, powerful protectors of Buddhist Law. From east, south, west and north they come, in their center Fudo, their leader, a sword in his right hand, a rope in his left. The fiendish ogress drops her wand. Faltering, eyes dazed, she cowers. Then, her secret hiding place exposed, she staggers out onto Adachi Moor, and her fiendish shouts mingle with the sound of the stormy night as her form fades from sight. For many in the audience, this was a line reminiscent of the Hollywood horror classic “A Nightmare on Elm Street” (“Whatever you do, don’t fall asleep!”). 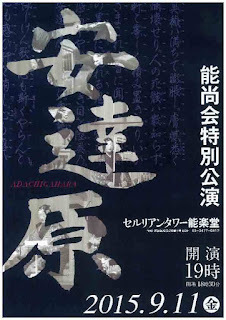 But the Noh play ‘Adachigahara’ is more than just scary, it is also a tragic, haunting play. Due in large part to the influence of Noh, there are moments of sympathy both for and by the demon, giving the play a pathos that can at times be wrenching. The memory of Yoshiteru Takeda’s performance haunts me still. A common question: How did you get involved with Noh（能）? Well, it was thanks to my potential mother- and father-in-law. I married into a family of professional Noh performers（観世流能楽師）. I have to admit, at first I immersed myself completely in Noh in an effort to convince them to let me marry their daughter. It worked. Now I'm completely addicted to Noh. Sumi-painter,Kumiko Lawrence, my wife of twenty-five years, works with me on my writings and presentations. 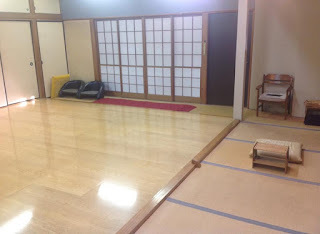 Below are photos of the Noh stage my father-in-law had built in his home, the stage where our son Edward studies and practices Noh. 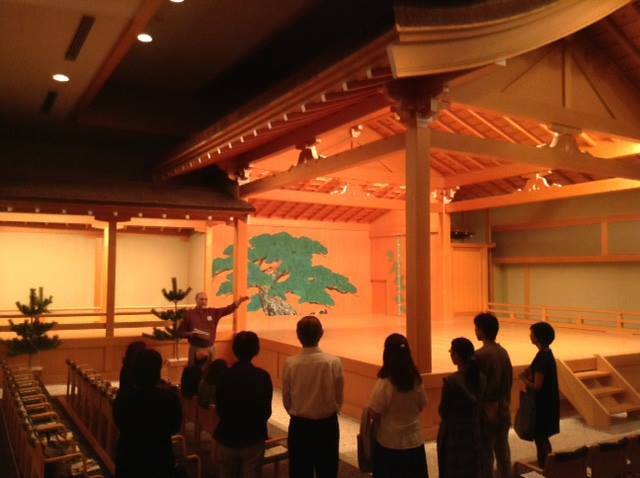 On September 11, 2015, at Shibuya’s Cerulean Tower Noh Theater in Tokyo, Soju Project led a pre-performance tour of the Noh stage at Cerulean Towers in Shibuya, Tokyo, followed by a special full performance of a full evening of Noh by the Takeda Noh Troupe. The traditional Noh stage, in addition to being beautiful, is fascinating in its construction as well as its symbolism. 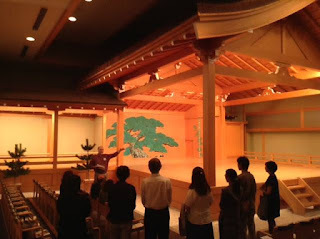 Many of the people who attended the tour had never been inside a Noh theatre before.